This Chocolate Cake Recipe truly is the BEST EVER! You HAVE TO try it! It’s a 3-layer, super moist chocolate cake with a rich, melt-in-your-mouth chocolate buttercream frosting. It’s covered with a chocolate ganache drip. It’s chocolate overload and you won’t regret it. For the frosting: Cut the butter into pieces. Using the paddle attachment, whip butter for 3-4 minutes, scraping down the bowl occasionally. Beat until butter looks light in color. Next, beat the cocoa powder into the butter until well mixed. Alternate adding 2-3 cups of powdered sugar at a time with the liquid ingredients: vanilla extract & heavy cream. Add pinch of salt as needed. Ensure all the powdered sugar is well combined and beat for 2-3 minutes before adding additional powdered sugar. Once all ingredients have been added, whip for 3-4 minutes until the frosting is light and airy. If the frosting is too thick, add additional heavy whipping cream 1 tablespoon at a time. For the chocolate ganache: In a microwave-safe bowl, combine the chocolate and heavy whipping cream. Melt the chocolate in the microwave at 50% power in 30-second increments and stir until completely combined. Allow to cool. Pipe the first layer of frosting, pipe in circles working outside edge to the middle. Spread evenly with an offset spatula. Add the second layer of cake and add the remaining frosting. Place the third layer of cake on top. Use you offset spatula to press any excess frosting onto the edges of the cake. To finish, pipe the frosting along the outside edge of the cake using a large open round tip or a cake icer tip. Then use an offset spatula or icing smoother to create a smooth edge. Use a spoon or piping bag to drizzle the ganache along the edges of the cake. To pipe the rosettes on top, use a large piping bag, fill the piping bag with the remaining frosting and pipe the boarder of the cake. 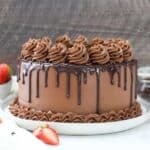 I prefer to use Hershey’s Special Dark Cocoa Powder for the cake and regular or dutch processed cocoa powder for the frosting. If you don’t have light sour cream, substitute nonfat Greek yogurt. If you don’t have light sour cream, regular will work but you can’t will be denser.